Pioneers in the industry, we offer inclined bucket elevator, vertical bucket elevator, screw elevator system and auger screw elevator from India. 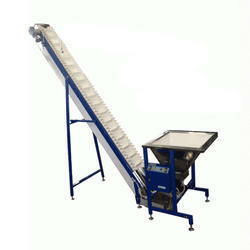 Inclined Bucket Elevator is a very important component of the packaging industry. 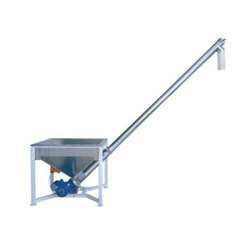 These bucket elevators are used to carry products to machine hopper, a speed of elevator and others in a synchronized manner with a basic and main machine. Vertical Bucket Elevator is very advanced and important component for the snacks packaging industry. These vertical bucket elevators are used to carry products to machine hopper, a speed of elevator and others in a synchronized manner with a basic and main machine. They are also equipped with vibratory feeding system on the groundhopper for easy feeding of snack product on to the buckets without breaking them. We are one of the leading organizations engaged in manufacturing and supplying Screw Elevator System. These precision engineered products are manufactured with supreme grade of raw material sourced from trusted vendors of the market. Our able quality inspectors duly inspect the make of the products and reject the defective products from the lot. 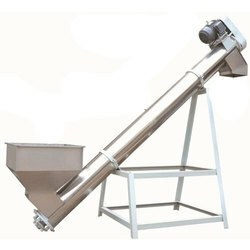 Auger Screw Elevator is the very important accessory component for the packaging industry. These Screw elevators are used to carry products from ground level to the machine hopper, a speed of the elevator and others are in a synchronized manner with a basic and main machine.